At the end of September’s post, I predicted October would be another busy month and it met – maybe even exceeded – expectations, including some big jobs and heavy lifting. Once Autumn arrives, the anticipation of winter and snow cover creates a certain drive to get the work accomplished which can be stressful. I suppose I am like my bees who become hurried, wild and intolerant of interference as the days grow shorter! The wet, dreary weather and some unforeseen setbacks didn’t help either. All that said, there were many successes and harvests that it will do me good to reflect on and hopefully be fun for you to hear about! Harvest this month consisted primarily of a few big days of work. The root crops – carrots, beets, and parsnips – were pulled and packed in sand in buckets to last us longer. For now these buckets are outside the back door. If we get a deep freeze before we eat them all we can move them into the house. I brought in the dried bean crop, now hanging in big paper bags in our living room. Then there was the winter squash. We had a very successful season with our final totals indicating we ended up with 1,200 pounds. 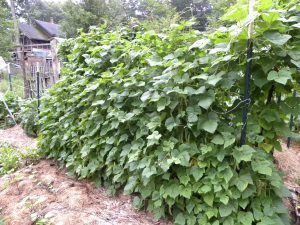 While I love winter squash for us and the animals and did want a lot, I definitely did not intend to grow this much! We had to come up with a lot more curing and storage space, which proved challenging because of this year’s rodent population explosion. I’d set the squash up somewhere in the greenhouse, thinking it was out of reach of critters, only to have bite marks appear on all of them! I have been carting these hundreds of pounds from here to there to yet another place! This is not the smart, efficient, permacultural system that we strive for, to say the least. But then again, there will always be surprises and challenges no matter how well-laid our plans. 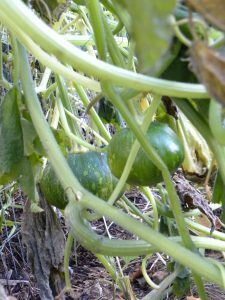 The mystery of the Seminole squash ended after the arrival of the first frost, causing the leaves to wither. 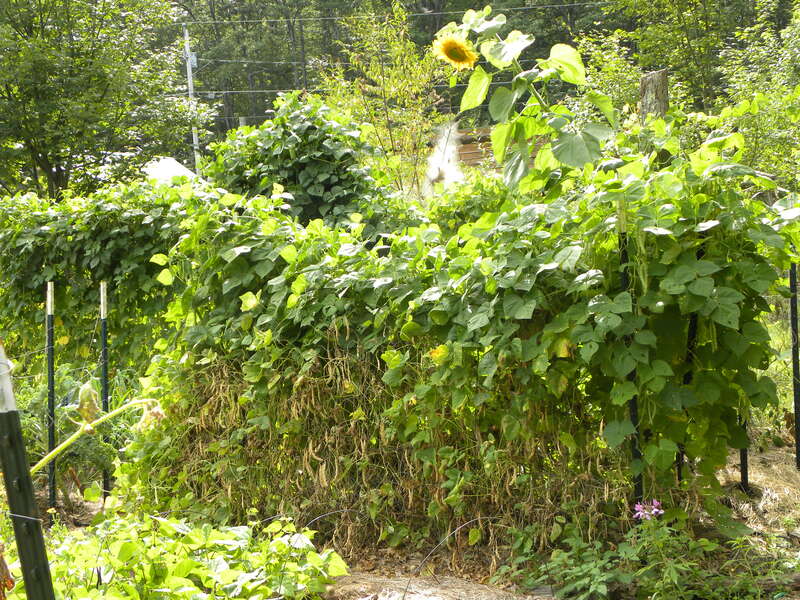 Hiking through the large amount of plant matter – vines and leaves – I found 414 # of squash. However, none of it was truly ripe. We can still eat it, it just isn’t as sweet as it could be, and it won’t keep as well. I love planting garlic and did so this year on October 22. One hundred and seventy-five cloves of four varieties: Music, NY Extra Hardy, Philips, and Red Russian. 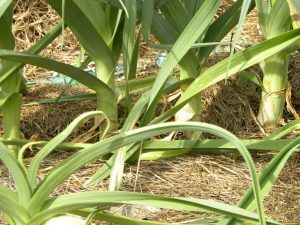 Exactly when to plant garlic is a topic of debate lately since the timing has become harder to get right. 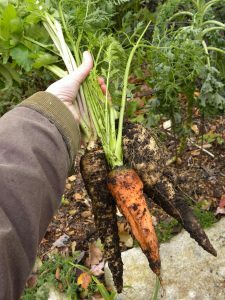 For the biggest, healthiest plants next year, they should have time in the fall to set roots but not send up green shoots. About a month before a hard freeze is ideal. When I started farming in 2008, we planted in late September. But with the shifting of our climate and seasons, it’s much harder to anticipate when the freeze will arrive. We had enough decent weather to work on soil building in our new garden and orchard areas. We haven’t gotten as far as we’d hoped because this Autumn mud season makes driving the truck on the land difficult. Using buckets and wheelbarrows takes longer, but keeps the job moving along. As I mentioned before, we had some problems this month, and this was probably the worst – all the beautiful, organic hay that we put up for the goats molded! Anyone else notice that we just had an incredibly humid late summer and early fall? I don’t know if we broke any records, but it was not our norm, and many people experienced issues in their gardens. My garden was fine, but not our hay. So, we had to pull it out, spread it around for mulching, and we’re now hunting for more hay. We had one lead, but that turned out to be moldy, too. Tough year here for hay. We had two more days of poultry processing, then integrated the birds we’re keeping. Our young rooster has not settled into his role, pecking at the hens rather than romancing them. 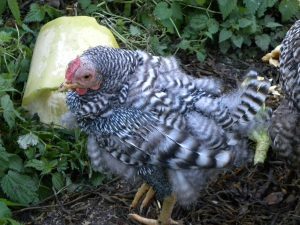 One of the young females is still small and a good flyer, so most nights she needs to be collected from a shelf in Steve’s shop and put into the coop. Hopefully everyone will settle in soon. For the first time, we had NPIP (National Poultry Improvement Program) testing of our chickens. 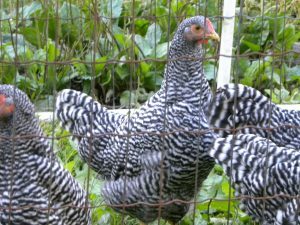 There is currently a free program in NH for having your birds tested for Salmonella and Avian Influenza. Having a proven clean bill of health (which we did receive) for these is a good idea since we sell birds at times. It also means we could bring our birds to shows if we ever wanted to try that! I did the first level of winterizing the bee hives by adding an upper entrance and insulation on top. Late November I’ll wrap them up as well, but it’s still a little too warm for that now. Tabitha and Bella, our cats, got to work once the heat died down, and helping to bring the rodent levels down before we are completely overrun, we hope. There have been a number of repairs and refinements needed on our various animal houses and outbuildings. Moving the winter’s wood supply onto our porch is about halfway finished with a cord in place. We are turning more of our attention back to community involvement. I attended permaculture, political, storytelling and Samhain events. All were important to me, even if they pulled me away from work here. It was time to bring in the root crops and winter squash, before the rodents ate them all! 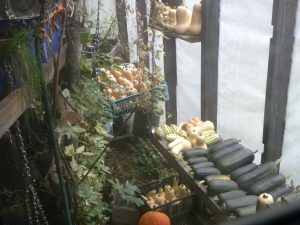 Winter Squash: 36.5# long pie pumpkin, 20.75# delicata, 60.5# butternut, 23.5# pumpkin, 414# seminole. That’s 555.25# winter squash harvested this month. I brought home 8 5-gallon buckets of gleaned apples for the animals and 20 5-gallon buckets of seaweed for the animals and gardens. From the animals we received 72 chicken eggs, 1 duck egg, 8 gallons of milk, and about 60# of meat. Eggs are done for the year while the older birds molt and we wait for the young ones to start laying. We made 238 kwh from the PV solar panels. I talked with an employee of a local solar company a couple of weeks ago and he confirmed that it wasn’t my imagination or a problem with our array, it has actually been dark! They have had inquiries from many people thinking that their systems weren’t working correctly, but they were just under-performing due to all the clouds we’ve been experiencing. From previous years we’re still eating: honey, canned peaches and blueberries, dried kale and beans, and frozen eggplant. November is goat breeding month here, so we’ll be moving animals around, pairing them up, and listening to them complain about the changes. Our buck, Marley, has been ready for a couple months as evidenced by the amazing smell he cultivates. Finalizing wood placement is on the top of our list. Then, we have a lot of projects we hope to make progress on before the weather really turns to winter. August brought us mostly July weather, kicking our plants into high production, but slowing us down. Hot, sticky, uncomfortable – I’d still take it over an ice storm any day! Regular, sometimes torrential, rains brought us out of the latest drought completely. 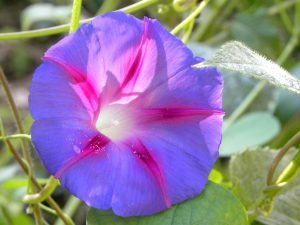 Amazing plant growth, the song of crickets and cicadas, and the crowing of a few too many roosters marked the month for me. August can be overwhelming with so much to do. It usually coincides with milder weather which helps, but not this time. We just can’t move as fast when it’s 90F and humid. 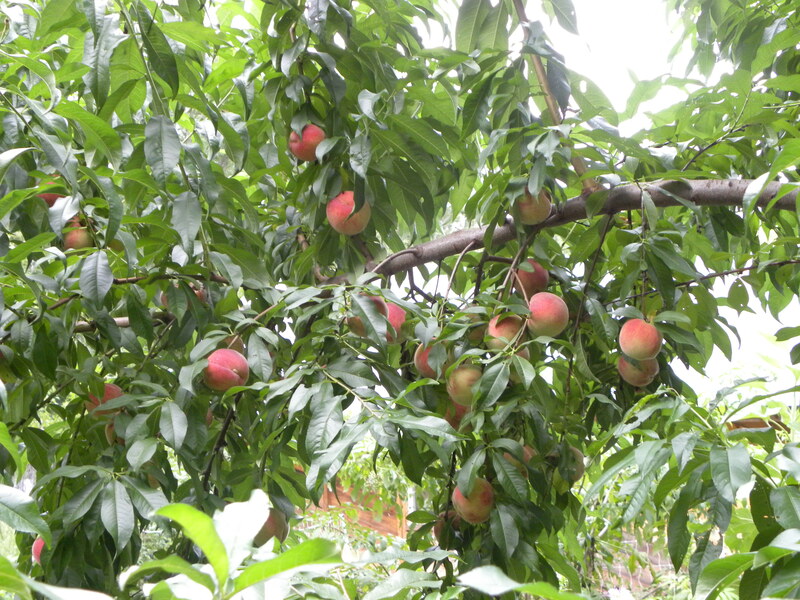 But, we kept on, and a lot did get done, with harvesting and food preservation taking center stage. Upkeep continued in the gardens. 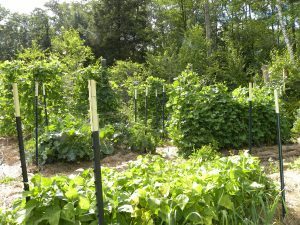 Tasks like trimming tomato suckers, thinning root veggies, keeping the beans on the trellises, and redirecting winter squash creeping over other crops. 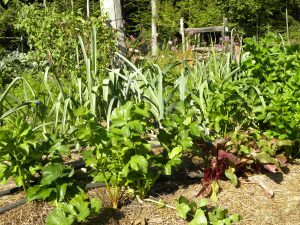 Planting for fall harvests of greens, radishes, and beans plus more cover crops. 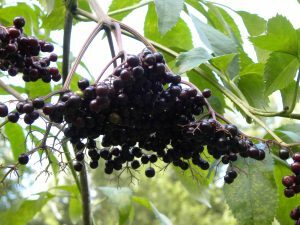 And, picking! 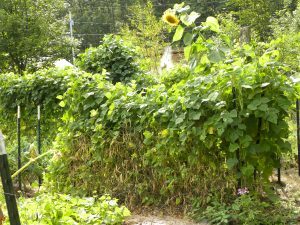 Here in our gardens, beans, summer and winter squash have been coming in strong, along with cucumbers, tomatoes, basil, radishes, greens and more. I’ll give you exact numbers in the harvest section coming up. The big question is always how to stretch this bounty into the colder months. Some crops store well with simple methods, others need more investment. The kitchen and I were occupied often with freezing, lacto-fermenting (using our own salt this year! ), dehydrating, and canning. The weather made those last two harder and I put off what I could for when the heat subsides. squirrel population explosion and resulting problems on roads. 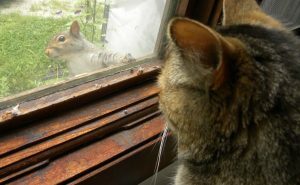 Our cats help with their hunting, but squirrels are too much for them. I see how those little terrier dogs can be valuable, but we’ll stick with cats for now. We continued with weed management in the fields, particularly keeping an eye on wild lettuce and thistle from which one flower can yield tens if not hundreds of plants. We had regular upkeep and tending of our critters, especially keeping their water access constant in the heat. Hay came in mid-month. We don’t make our own, but get it locally. It was a big job just to pick up and unload the two hundred bales we could cram into our various outbuildings. All our reorganizing paid off by allowing us to store that much – about 50 more than we’d thought we could fit. What a relief it is to have a good crop put up for the coming year! The bees aren’t having a great year. 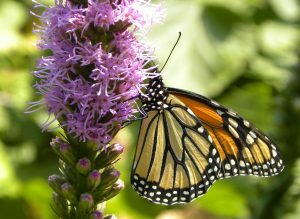 There seems to be a nectar shortage, noted by many beekeepers in the Seacoast. I have great new queens and busy bees, but without more food access they are limited in raising brood and are not able to store for the winter. They were also exhibiting robbing behavior when I inspected, which again pointed to not enough food. Mid-month I decided to start feeding them sugar syrup. I just didn’t feel I could count on a great fall flow to make up for the poor season. The good news is that the last time I opened them up, I could distinctly smell Japanese knotweed nectar. I know that knotweed is a plant that causes some problems and I promise I haven’t planted it, but I have to be honest: it is a huge boon to the bees. 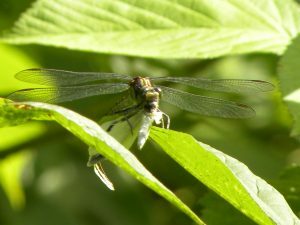 Good or bad, black or white, one or the other are dichotomies that don’t hold up that well in nature. Life is complicated! I guess I am grateful that I didn’t try to grow my apiary this year. A few years ago I was trying an expansion project when we got hit with that intense drought and I ended up buying more sugar for those dozen colonies than I had over all my previous years of beekeeping combined. 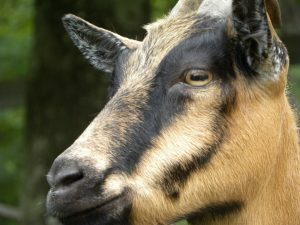 A difficult task this month was harvesting the young boy goat. For those of us who didn’t learn that skill when we were young, it is a tough part of farming to get used to and honestly makes me wonder if I can keep doing it some years. But then I see a film like “Eating Animals” which Seacoast Permaculture partnered with The Music Hall to show in late August. It looked at the cruelty and negative environmental and human health impacts inherent in modern, industrial animal keeping for meat, eggs and dairy. Truly, deeply upsetting. Death is the kindest thing that happens to these creatures. I think only people who care about animals and find it hard to take their lives should raise them, and this strengthens my resolve to keep at it. It’s a good reminder as we move into our season for harvest of meat, and probably a good topic to write about more often. 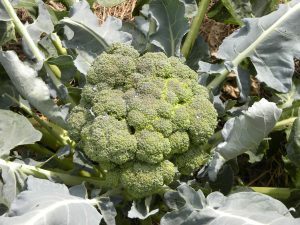 Here’s what I brought in from the gardens this month: 79.25# yellow summer squash, 12.75# zucchini, 47# string beans, 16# cucumbers, 6.75# kale & collards, 75 radishes, .75# celery, 1# broccoli, 9.25# tomatoes, 5# basil, 2 leeks, 2 carrots, 190# long pie pumpkins, 1# delicata winter squash, 22# peaches, 1.75# elderberries, and 5# clove currants. There were also grapes and raspberries, but they didn’t make it as far as the kitchen for weighing! 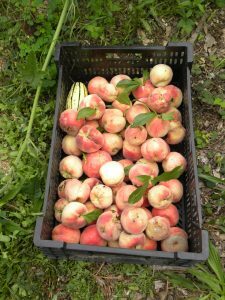 I brought home from local sources 23# of blueberries, 11 5-gallon buckets of gleaned apples (wild in public places) for the goats (I got tired of weighing them so started measuring them by bucketload), and enough peaches to can about 50 quarts. From the animals we received 181 chicken eggs, 105 duck eggs, 10.9 gallons of milk, and 16# of meat. We only made 421 kwh from the PV solar panels because there was a problem with our inverter resulting in the system being off for a week. There were a lot of cloudy days as well. Even though the days are getting noticeably shorter now, I think September will still be a better month. 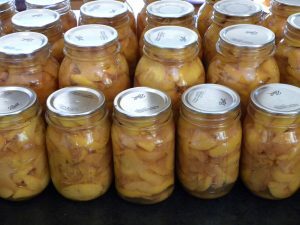 Given the current forecast for an abnormally hot month, I expect to bring in a lot of produce and be working to preserve it. 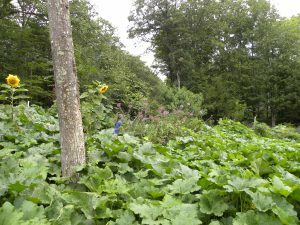 We have tremendous winter squash vines that I hope will set a lot of fruit – it’s hard to tell under the dense foliage – and the tallest sunflowers I have ever grown. I expect I’ll have to compete with the squirrels for those. When it gets cooler I can get back to canning and we can work on harvesting meat. It’s also time to start paying more attention to larger world issues with elections and other excitement coming up… so, yes, I expect it to be busy but I still plan to enjoy the warmth and the sun and the sounds of summer all month long.